The emphasis here is household accounts and day to day records. Read Chapter Eight as html (below). Chapter Ten transcribed from F.A. Gasquet's English Monastic Life. For even more information about abbeys, monks and religious Orders, see my abbey bookmark pages. by Richenda Fairhurst, historyfish.net. February 2008. Gasquet, F. A., English Monastic Life, Methuen & Co., London<. 1904. Chapter Eight. 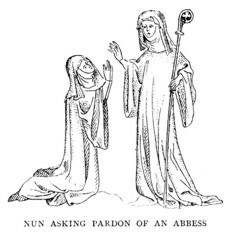 No account of English monastic life would be complete without some special reference to the nuns and nunneries.It is, it may be first observed in passing, altogether wrong to apply the word “convent” exclusively to houses of nuns, as is so frequently done in these days. The title “convent” as well as that of “monastery” and “abbey” was applicable to any house of either monks or nuns, and the exclusive use of the word for a religious house of women is, indeed, of quite modern origin. “Was so charitable and so pitous. . .
in Chaucer’s tales, there is but little information to be obtained about the nuns of England ; of the simple, hard, yet happy lives they led in their cloistered homes, and of the ample charity they dispensed to all in their immediate neighborhood. Of course, so far as the usual forms, manners, and customs of cloister life are concerned, what has been already said of the monastic method of life generally, applies to nuns, with certain necessary reservations, as well as to monks and canons. 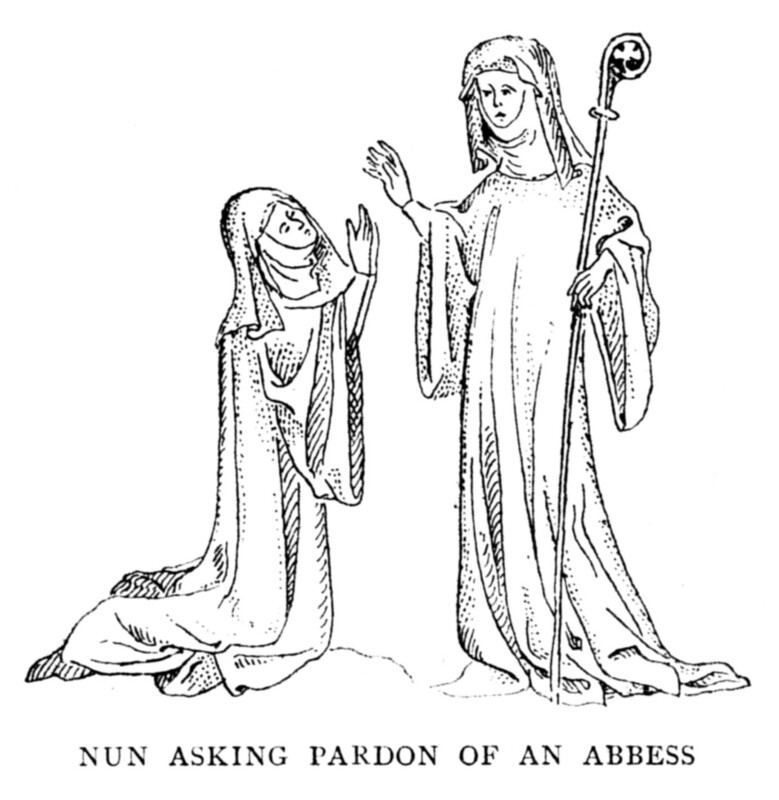 It will be useful, however, to furnish the reader with some account of certain special features of female religious life.One of the most charming medieval picture of that life is given in an account of the abbesses of the Benedictine nunnery of Wherwell,in Hampshire. It records the unblemished life and good deeds of the abbess Euphemia, who ruled the house from A.D. 1226 to 1257, and is translated from the chartulary of the abbey by the Rev. C. Cox in the second volume of the Victoria History of the County of Hampshire.The account is too delightful not to be given in full. the main buildings, and in conjunction with it a dormitory with the necessary offices.Beneath the infirmary she constructed a watercourse, through which a stream flowed with sufficient force to carry of all refuse that might corrupt the air. Of the life, social and religious, led by the nuns of England, something may be learnt from the few scattered account-books that have survived the general destruction of documents in the sixteenth century. The following sketch is founded upon one such paper-book of accounts now in the public Record Office. It was printed privately some few years ago, and is here reproduced as affording, in the judgment of some, a not uninteresting glimpse into the cloister life and work led in the nunneries in the early days of the fifteenth century.The accounts were kept in a small book by a nun called Dame Petronilla. Our guide-books, of course, ascribe the destruction of the convent in 1539 to the fact of serious complaints having been made of certain irregularities on the part of the inmates. Most people nowadays know how to estimate these “complaints” at their right value, proceeding as they did from the Visitors of Henry VIII., who having been sent for the purpose of finding evidence of irregularities to justify the intended spoliation, of course found them.In the special case of this convent of Grace Dieu we have subsequently the direct testimony of the country gentlemen of Leicestershire, that the fifteen nuns following the rule of St. Austin then inmates of the establishment, and whose good name had been so vilely traduced by the king’s emissaries, were all “of good and virtuous conversation and living,” and that their presence in the wilds of Charwood Forest was a blessing to the neighourhood. enough in its style of book-keeping, presents in reality the general accounts of the house. Probably Dame Petronilla would have opened her eyes very wide indeed at the present system of elaborate checks and counter-checks devised to exercise the brains and possibly the patience of modern cellarers, and “double entry” and such-like mysteries would probably have seemed to her a useless expenditure of time and nerve-power, and hardly consistent with the religious simplicity which ascetic writers had taught her to cultivate. Her style is simplicity itself : so much received for such a thing, ordinary or extraordinary : so much spent, and on what ; that is all. years, Dame Petronilla chronicles the death of a good many of the convent pigs from disease. Their stock of cattle appears somewhat large at first sight, till it is realized that with one thing and another there were a good many mouths to feed in this establishment. Thus in one year we find a list of 32 cows, “three of which had not calved ; three bulls, 16 steers, 22 heifers and eight bull calves.” Besides this there were 27 yoke-oxen under the care of their driver, and 29 calves, one of which on the account-day is noted as having, since the making of the list, gone to the cook to furnish forth the conventual dinner.At this same time Henry Smyth, the outdoor bailiff, gives in the account of Henry, the shepherd, which shows that that he had 103 ewes and 52 lambs under his pastoral charge. sold at 2s. each, and that there was a sale of hurdles and faggots about Shrovetide. Thirty stone of wool was purchased at one time by one Thomas Hunte, a neighbour, who, by the way, had his two daughters evidently at school in the convent ; once there was a sale of fish from the mill down at Belton, and it brought into the nuns exchequer over £6. Another practice revealed by these old accounts was that of people coming to stop at the convent for the celebration of some of the greater feasts. 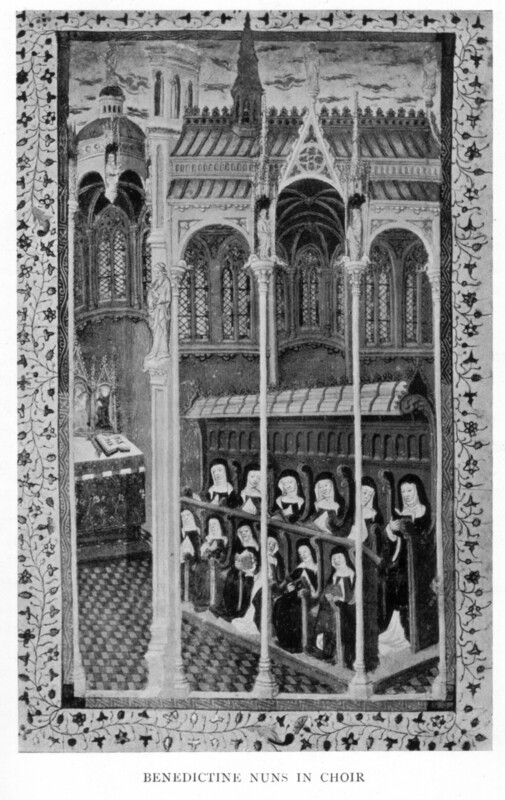 Thus for one “All Saints’ Day,” Mary de Ecton, Joan Villiers, and the two daughters of Robert Neville were lodged and entertained by the nuns. These visitors eventually made and offering for the hospitality shown them ; as, for instance, on this very occasion each of the Neville ladies paid 5s. and Joan Villiers 6s. 8d. The last-named lady was at Grace Dieu no less than four several times in the year 1418, and each time left behind a similar offering. At another time Giles Jurdon paid 7s. for the board of his daughter during the week of Pentecost, when she probably came to visit her sister, who, known as Dame Elizabeth, was a nun in the convent. Roger Roby also, who was apparently the father of Dame Alice, was entertained by the nuns twice in the year 1416, and gave an alms of 6s. 8d. at one visit and 13s. 4d. at the other. Dame Elizabeth Jurdon (originally put 3rd). Dame Petronilla Dunwich (originally put 5th). 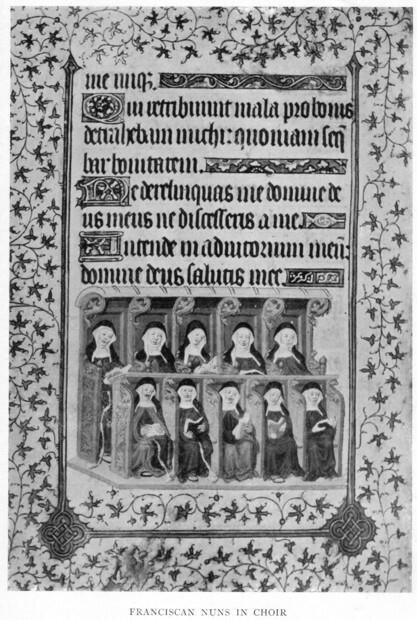 It may be mentioned that Dame Petronilla and her assistant Dame Katherine made up their accounts from Sunday to Sunday, as far as expenses are concerned, so that in running through the pages it is possible to form some idea of how these good medieval nuns lived.I do not think that the most captious critic could charge them with feasting on the “fat of the land,” or with much indulgence in the luxuries even of those primitive days.There is one peculiarity, however, in these otherwise excellent accounts, which rather interferes with a full knowledge of the commissariat at Grace Dieu. The sisters did not think it necessary to enter among the payments the value of the farm and garden produce they consumed, beyond the cost of sowing and gathering into their barns. However, we know that they must have eaten bread and made use of the exceedingly few vegetables and pot-herbs that were then grown in the gardens of England, so we may take these as additional to the “food stuffs” shown in the accounts as paid for. A few examples will be sufficient to give the reader an insight into the general catering at Grace Dieu early in the fifteenth century. These are the first entries among the expenses written by Dame Petronilla when she commenced her duties as “Treasurer,” as she calls herself in one place, after the Feast of the Purification, 1414. “For two Sundays after the Purification purchased two small pigs price 6d. For house food during the time of Lent, £3 6s. 8d. to the time-honoured Easter-day joke of “the devil on horseback,” or a split red-herring riding as a jockey on the back of a duck, perpetrated by the convent cook. The almonds and raisins were a great luxury to the good sisters, and only on a few other occasions during the four years of Dame Petronilla’s housekeeping does this extraordinary expense occur! We cannot help thinking, too, with what pleasure the nuns must have welcomed the change of fish diet on the Friday in Easter week. Two shillings was in those days a great sum to pay for any article of food, but the fresh sea fish must have been scarce enough in Charnwood Forest before the days of railroads. “White herring fresh, if it be seaward and newly caught, with the roe white and tender,” says an old authority, “is toothsome food” ; and the Book of Nurture tells “the cook” how best to prepare it for this master’s eating. eaten on Low Sunday.One All Saints’ Day, by the way, the nuns had four geese, for which the price paid was 3d. each ; and one Christmas Day their table was supplied from the farm with nine fowls, and we are told they had seven at their dinner, the other two being reserved to furnish forth their suppers.Pork, beef, veal, and fish : these were the ordinary dishes supplied. Mutton, curiously, though not altogether rare, does not appear very frequently in their menu, and lamb is named as a dish at only one of my lady prioress’s little banquets ; although the receipt for “lamb-skins sold from the kitchen” shows that it was not altogether unknown to the common table. Probably these nuns were “good housewives” in the best sense, and preferred to get all they could out of their flocks in the shape of wool, etc., rather than eat tender, but tasteless and immature mutton. of the others.Whatever there was to be done, inside or outside the house, it is evident that no one but Henry Smith could see to it properly. “Paid for the spinning of six score (bundles) of linen flax, 5s. ; paid for weaving the three score ells of linen cloth from the same, 3s. 4d. ; paid for woofing and warping three-and-twenty ells of woolen cloth, 6s. 2d. ; paid for dyeing twenty-seven ells of cloth blood red, at 4d. the ell, 7s. 8d. ; paid for spinning woolen cloth for ordinary livery, 11d.” ; and so on. farm, and in the laundry, the kitchen, and the bakehouse, etc. Curiously, as it seems to us perhaps now, each of the nuns had a maximum allowance of 6s. 8d. a year for clothes.It taught them, nodoubt to look after the articles of their dress with care and thrift, better than if the white woollen tunic, scapular and veil, woven from the produce of their own flock of sheep, and the still whiter linen wimple spun from the flax and made into good sound cloth by their own hands, or at least under their own direction, were to appear to drop from the hand of Providence without reference to cost. One or two curious entries seem to show that friends sometimes gave the annual sum allowed for the clothing of some of the nuns. Thus one year William Roby paid “for the clothes of his relation, Dame Agnes Roby” ; and at another time Margaret Roby brought the 6s. 8d. for the same purpose when she came on a visit. One interesting item of knowledge about the work of the nuns is conveyed in a brief entry of receipt. It is clear that these ladies were good needlewomen, and their work must have been exceptionally excellent, seeing that a cope was purchased from them by a neighbouring rector for £10. had a pair of gloves given them before they were set to the task, and the entire work cost the convent 10s. 3d. Three men beyond the usual farm staff were ordinarily employed in cutting the grass, and in making and stacking the hay. In the general harvesting, men and women were employed in the fields ; and, be it remarked, their labour was paid for at the same rate. What are called the autumn works—the harvesting and the subsequent cleaning of the ground—seem to have lasted about seven or eight weeks, and were begun soon after the feast of the Assumption of our Blessed Lady. It is curious, and not uninteresting, to find that the Irish came over for the harvesting in Leicestershire in the fifteenth century as they do now ; thus we have Mathew Irishman and Isabel Irish named, together with Edward Welshman, as engaged in the fields of Grace Dieu in 1415. Altogether, the cost of the extra labour in the autumn works amounted to nearly £10, a large sum indeed in those days. their meals, since Dame Petronilla gives 16d. for a calf to feed them specially, on a day when evidently she and her sisters in religion were eating fish in the convent refectory. A word must now be said about the necessary item in the accounts of very well-regulated religious house, “repairs.” These seem to have exercised the two bursars of Grace Dieu very considerably. The special trouble evidently began with the roof of the house. In the first year of their stewardship they had in, of course, Robert the Slater, and for some reason his bill was only partly met in that twelvemonth. All during Lent, he and his mate were at work mending holds, and making others. From the house his ministrations extended to the cloister. Then came the gutters all over the establishment, which stood in urgent need of attention, as gutters always appear to do, even in our more civilised days. Next it was found that the church must be looked to ; and before this was over, the dependants had come to the conclusion that whilst all this repairing was being done at the convent and Robert the Slater was about with his mate and his materials upon the ground, it would be a pity not to renovate their cottages. Poor Dame Petronilla must have been well-nigh distracted at the thought that Robert the Slater—who, by the way, did more than roofing, and seems to have been a jack-of-all-trades, though loose tiles were his forte—having once secured a foothold in the establishment, had come to stay.But she gave in with exemplary resignation, and the dependants had their cottages repaired, or what was the same thing, received money to pay for them. Taking one thing with another, more than £10 went in this way during the first year of the procuratorial reign of Dames Petronilla and Katherine. Among the workmen that haunted Grace Dieu in these days, and who, if there is any fitness in things so far as ghosts are concerned, ought to be found haunting the ruins to-day, was on called Richard Hyrenmonger. He came, we learn, from Donington, and the accounts prove that he must have had a good store of all kinds of nails, and keys, and bolts, judging by the variety he was able to produce. Under him worked John the Plumber, or rather two Johns the Plumber, senior and junior; and, like modern plumbers are wont to do, they appear to have plagued Dame Petronilla and her assistant with their constant tinkering at the pipes and drains of the establishment. “John the senior” and “John the junior,” for example, were six days mending “le pype,” for which they were paid 3s. 4d. ; but apparently it was not properly done, for just after this, “le pype” misbehaved itself again, and Dame Petronilla had to purchase a new brass pipe to bring the water to the door of the refectory, and the two Johns were at work again. Of course Richard the Ironmonger always found a lot of work for himself on the farm, so that what with one thing and another, Grace Dieu must have been a very comfortable inheritance for him. had an oil lamp of some kind, and we read of special candles for the wash-place and at the door of the refectory, etc. It is to be supposed that the nuns had some means of warming themselves during the cold winter months, for we read of a travelling tinker employed upon mending a chimney to the hall fireplace, and probably they were burning logs from out of the Charnwood somewhere or other ; but in these accounts there is no mention of fuel except on one occasion, when Richard the Ironmonger had some coal purchased for him ; but this was only that he might heat a ploughshare that had got out of shape. Another most important matter in medieval times was the annual salting ofthe winter provision which took place in every establishment. On St. Martin’s Day, November 11th, the medieval farmer considered seriously what was the number of this live stock, what was his store of hay, and how long the one could be kept by the other.The residue of the stock had to go into the salting-tub for the winter food of the family and dependants.So at Grace Dieu the purchase of the salt for the great operation is entered in the accounts. On one occasion also Dame Petronilla, “when a boar was killed”—whether by accident or not does not appear—had it spiced as well as salted, and it was no doubt served up on great occasion as a special delicacy in the common refectory. --175-- beyond their means. The sum was only slight, being but £7 11s. 10½d., and it is pleasant to observe that “out of love of the nuns,” and “to relieve the house of anxiety,” a lady paid the deficit, making her gift £7 12s. Dame Petronilla and Dame Margaret ! how little they could have thought when they penned their simple accounts that they would have given much pleasurable information five hundred years after their time ! How little they could ever have dreamed of the pleasant light their jottings would have thrown on so many of their doings and their little ways! they were kind, prudent, charitable souls, without a doubt, and if they might at times have used better ink than they did, that fault was a point of holy parsimony.And if they might have given here and there just a little more information on certain points, they are willingly forgiven and more than forgiven, for what they have left to posterity. Their souls, oft so troubled and vexed by the many cares incidental to the office of a conventual Martha, have long doubtless been in peace, and their spirits no longer vexed by Richard the “Hyrenmonger” and the two Johns, the senior and junior plumbers. What would they think, could they to-day revisit the scene of their former labours and cares? The old home they evidently loved so well is past repairing now, and not even the kindly help of that old servant and friend of the convent, Henry Smith, could avail to suggest the best way of setting about reparation. Sche was i-fostryd in a nunnery . . .
list that is set forth begins with a Plantagenet and includes Tichbornes, Poles, and Tyrrells. So, too, in the case of the Benedictines of Barking, of Kingsmead, Derby, and of Polesworth and Nuneaton, Warwickshire ; of the Cluniacs of Delapré, Northampton ; of the Cistercians of Wintney, Hants ; and of the Gilbertines of Shouldham, Norfolk, it can be established that not only were many of the nuns of good birth, but that their pupils were in the main drawn from the same class. The Episcopal Visitations of the Diocese of Norwich for 1492 to 1532, edited by Dr. Jessop, throw some interesting light on the inner life and social working of the nunneries of East Anglia.From the names of the inmates it becomes evident taht some of these houses were in the main occupied by ladies of gentle birth, such as Willoughbys, Everards, Wingfields, Jerninghams, and the like. This was especially the case with the Austin house of Campsey and the Benedictine houses of Bungay and Thetford. When Bishop Nicke visited the last of these houses in 1514, complaint was made to him by one of the ladies that the prioress was intending to admit an ignorant (indocta) novice, and particularly one Dorothy Sturges, who was deaf and deformed. Apparently the arguments of the objector prevailed, but poor Dorothy was, not long after, admitted to the smaller nunnery of Blackborough. is a little touching to note that almost the only complaints that reached the bishop’s ears were those of the aged sub-prioress and Dame Margaret that the pace of chanting the Office by the sisters was too rapid, and lacking their proper pauses, and that of Dame Katherine who found the beer to small. At the next recorded visitation, six years later all these good old ladies were still at Carrow, though Dame Anna’s age did not allow her to discharge the duties of sub-prioress ; but she was then (1532) in charge of the infirmary. At this time the bishop interfered, probably at the suggestion of the aged dames, to stop an accustomed Christmas game (on Holy Innocents’ Day), when the youngest of the novices assumed the functions of a lady abbess, after the same fashion as a boy-bishop amongst the choir boys.The nuns of Carrow maintained a school for some of the better-class girls of the city and district, and doubtless this Christmas-tide sport was intended in the main for their delectation.